Fracture repair is the process of rejoining and realigning the ends of broken bones, usually performed by an orthopedist, general surgeon, or family doctor. In cases of an emergency, first aid measures should be used to provide temporary realignment and immobilization until proper medical help is available. Fracture repair is required when there is a need to restore the normal alignment and function of a broken bone. Throughout the stages of fracture healing, the bones must be held firmly in the correct position. In the event that a fracture is not properly repaired, misalignment of the bone may occur, resulting in possible physical dysfunction of the bone, adjacent joint, or region of the body. The incidence of fractures that occur in the United States can only be estimated because fractures are not always reported. The average person sustains two to three fractured bones during the course of a lifetime. A reasonable estimate is approximately nine million fractures per year. Fractures are slightly more common in children and adolescents than in young adults due to the levels and kinds of activities in which they engage. Fractures become more common in adults as they age, however, due to changes in bone structure and generally diminished levels of physical activity. Fracture repair is accomplished by means of applied traction , surgery, and immobilizing affected bones. The bone fragments are aligned as closely as possible to their normal position without injuring the skin. Metal wires or screws may be needed to align smaller bone fragments. Once the broken ends of the bone are set, the affected area is immobilized for several weeks and kept rigid with a sling, plaster cast, brace, or splint. With the use of traction, muscles pulling on the fracture site are neutralized by weights attached to a series of ropes running over pulleys. Strategically implanted electrical stimulation devices have proven beneficial in healing a fracture site, especially when the fracture is healing poorly and repair by other means is difficult. Fractures are commonly diagnosed on the basis of history of trauma or the presence of pain. An x ray is usually taken to confirm the diagnosis. Precautions for fracture repair include any relevant factors in an individual's medical condition and history. These include allergic reactions to anesthesia and the presence of bleeding disorders that may complicate surgery. Preparation often begins with emergency splinting to immobilize the body part or parts involved. When fracture repair is necessary, the procedure is often performed in a hospital, but can also be successfully done in an outpatient surgical facility, doctor's office, or emergency room. Before any surgery for fracture repair, blood and urine studies may be performed. X rays may be obtained. It must be noted, however, that not all fractures are immediately apparent on an initial x-ray examination. In such a case, when a fracture is highly suspected, the extent of the fracture can be properly diagnosed by repeating the x rays 10–14 days later. Depending upon the situation, local or general anesthesia may be used during fracture repair. Immediately following surgical repair of a fracture, x rays may be again taken through the cast or splint to evaluate whether the rejoined pieces are in good position for healing. The x ray can be performed either before the application of the splint or at least before an individual is awakened from the general anesthesia. Persons need to exercise caution and not place excess pressure on any part of the cast until it is completely dry. Excess pressure on the operative site should also be avoided until complete healing has taken place and the injury has been reexamined by the physician or surgeon. If the cast becomes exposed to moisture, it may soften and require repair. For this reason, plastic has largely replaced plaster as the casting material of choice. The injured region should be elevated or propped up whenever possible to reduce the possibility of swelling. Surgical risks of fracture repair are greater in persons over 60 years of age because the bones often require more time to properly heal. Obesity may place extra stress on the fracture site, affecting healing and possibly increasing the risk of re-fracturing the same bone. The healing process after fracture repair may also be slowed by smoking, as well as by poor nutrition, alcoholism, and chronic illness. Some medications may affect the fracture site, causing poor union; such medications include anti-hypertensives and such steroids as cortisone. Possible complications following fracture repair include excessive bleeding, improper fit of joined bone ends, pressure on nearby nerves, delayed healing, and a permanent incomplete healing (union) of the fracture. If there is a poor blood supply to the fractured site and one of the portions of broken bone is not adequately supplied with blood, the bony portion may die and healing of the fracture will not take place. This complication is called aseptic necrosis. Poor immobilization of the fracture from improper casting that permits motion between the bone parts may prevent healing and repair of the bone, and result in possible deformity. Infection can interfere with bone repair. This risk is greater in the case of a compound fracture (a bone fracture involving a portion of bone that breaks through the surface of skin). Compound fracture sites provide ideal conditions for severe infections by Streptococcus and Staphylococcus bacteria. Occasionally, fractured bones in the elderly may possibly never heal properly. The risk is increased when nutrition is poor. Once the procedure for fracture repair is completed, the body begins to produce new tissue to bridge the fracture site and rejoin the broken pieces. At first, this tissue (called a callus) is soft and easily injured. Later, the body deposits bone minerals (primarily compounds containing calcium) until the callus becomes a solid piece of bone. The fracture site is thus further strengthened with extra bone. It usually takes about six weeks for the pieces of a broken bone to knit (heal) together. The exact time required for healing depends on the type of fracture and the extent of damage. Before the use of x rays, fracture repair was not always accurate and frequently resulted in crippling deformities. With modern xray technology, physicians can view the extent of the fracture, check the setting following the repair, and be certain after the procedure that the bones have not moved from their intended alignment. Children's bones usually heal more rapidly than do the bones of adults. Morbidity associated with fracture repair includes damage to nerves or primary blood vessels that are adjacent to the fracture site. Improper alignment causing deformity is an abnormal outcome that is relatively rare due to presently available medical technology. Mortality associated with fractures is also rare. It is usually associated with infections or contamination acquired during the fracture process. There are no alternatives to proper fracture repair. Problems associated with allowing a fracture to heal without intervention include misalignment, deformity, loss of function, and pain. Magnetic fields are occasionally used to stimulate healing when conventional techniques are not effective. See also Bone grafting ; Orthopedic surgery . Browner, B., J. Jupiter, A. Levine, and P. Trafton. Skeletal Trauma: Fractures, Dislocations, Ligamentous Injuries, 3rd edition. Philadelphia: Saunders, 2002. Eiff, M. P., R. L. Hatch, W. L. Calmbach, and M. K. Higgins. Fracture Management for Primary Care, 2nd edition. Philadelphia: Saunders, 2002. Staheli, L. T. Fundamentals of Pediatric Orthopedics, 3rd edition. Philadelphia: Lippincott, 2003. Henry, B. J., et al. "The Effect of Local Hematoma Blocks on Early Fracture Healing." 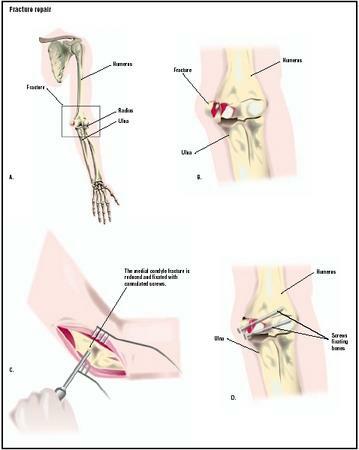 Orthopedics 25(11) 2002: 1259–1262. Ong, C. T., D. S. Choon, N. P. Cabrera, and N. Maffulli. "The Treatment of Open Tibial Fractures and of Tibial Non-union with a Novel External Fixator." Injury 33(9) 2002: 829–834. Sammarco, V. J., and L. Chang. "Modern Issues in Bone Graft Substitutes and Advances in Bone Tissue Technology." Foot and Ankle Clinics of North America 7(1) 2002: 19–41. Szczesny, G. "Molecular Aspects of Bone Healing and Remodeling." Polish Journal of Pathology 53(3) 2002: 145–153. American Academy of Orthopaedic Surgeons. 6300 North River Road, Rosemont, IL 60018-4262. (847) 823-7186 or (800) 346-2267. http://www.aaos.org/wordhtml/home2.htm . American Society for Bone and Mineral Research. 2025 M Street, NW, Suite 800, Washington, DC 20036-3309. (202) 367-1161. http://www.asbmr.org/ . Evanston Northwestern Healthcare (Northwestern University), [cited February 28, 2003] http://www.enh.org/surgery/100077.asp . International Society for Fracture Repair, [cited February 28, 2003] http://www.fractures.com/isfr/ . National Library of Medicine, [cited February 28, 2003] http://www.nlm.nih.gov/medlineplus/ency/article/002966.htm . University of Maryland College of Medicine, [cited February 28, 2003] http://www.umm.edu/news/releases/hip.html . Fracture repair is usually performed by an orthopedic surgeon, general surgeon, or family physician. In cases of an emergency, first aid measures should be used for temporary realignment and immobilization until proper medical help can be obtained. Relatively uncomplicated fractures may be immobilized in a physician's office. More commonly, fractures are treated in a hospital setting. What type of fracture do I have? Is the surgeon properly trained in the proposed method of fracture repair? I fractured the bone (width-wise) on the tip of an index finger as a teen, and it healed without treatment, but is misaligned. Periodically I feel pain after heavy work. Can it be repaired? This bone is already small, and I don't want a treatment with incomplete result, or one that makes things worse. There is no arthritis. I'm about 45 years old. i had n accident last month as a result of that my left leg's tibia bone had hair line fractured..now have to be on bed for 3 weeks i want to know is there any technique which heal my bone fast...also m an alcoholic.